For instant spending notifications. Fee-free spending abroad. Easy budgeting tools. And friendly help from real people all day every day. See an overview of your account any time, sorted by what you spend on, with notifications if you’re spending too fast. Make payments on the go with Apple Pay or Google Pay. Setting up couldn’t be easier - just go to the Account tab in your Monzo app. Withdraw up to £200 abroad every 30 days for free (there’s a 3% charge after that). Send bank transfers that arrive instantly, and pay nearby friends over Bluetooth without needing to know their details. Send money internationally from your Monzo app for up to 8x cheaper than with high street banks, powered by TransferWise. A full UK bank account that you can open from your phone in minutes. The Current Account Switch Service makes it simple, reliable and hassle-free to switch from one UK bank to another. Set up Direct Debits and standing orders in-app, and send money to any other UK bank account instantly. If you’re eligible, you can switch on an overdraft in the app any time. Don’t want an overdraft? No problem, you don’t have to have one. 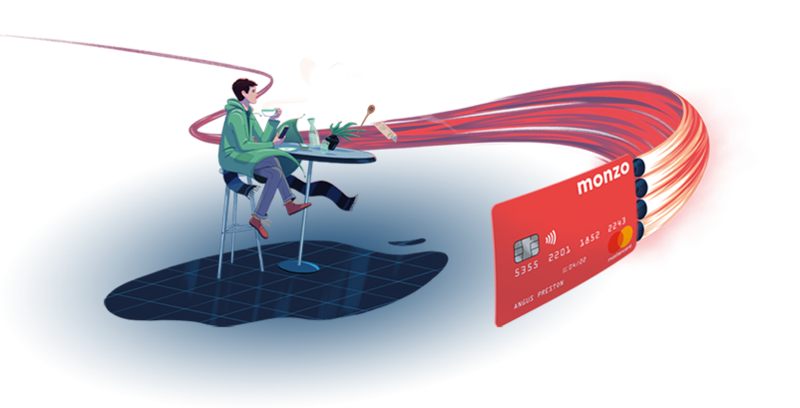 Every Monzo account is protected by the Financial Services Compensation Scheme (FSCS), so your money is safe up to £85,000 no matter what happens. We might be a bank in an app, but we’re always here to help. Every customer gets access to 24/7 customer support through the app — just send us a chat message and we’ll get back to you ASAP. Not into chat? Email or call us at any time. We're doing things differently. For too long, banking has been harder than it needs to be. We want to change that and build a bank with everyone, for everyone. Join our amazing community of users and suggest features, give feedback and help us test the app, so together we can build something we all love.